When I have travelled in the American Southwest, I have found that the month of March serves me best. Firstly, it is ‘low season’ for tourism, even though there still can be many people at the popular sites, it would be no comparison with the high season when the region must be packed. Secondly, temperature: walking in the desert in March is comfortable, usually with a cool breeze blowing, although one still must be very much aware of dehydration and carry/drink plenty of water. Thirdly, and primarily for the photography, is the changeable weather – not clear blue skies, but thunderclouds, storms, pools of water, reflections etc. 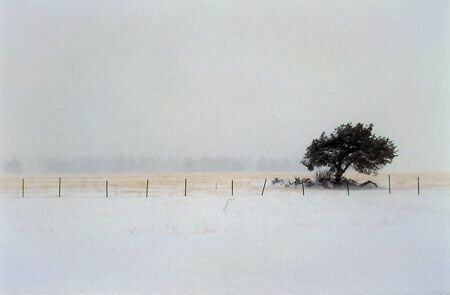 With this is mind, March 2000 saw me leading a group of photographers north from Phoenix to Flagstaff (with 12 inches of recent snow at Sedona). The following day was scheduled for early rise and up to the Grand Canyon for the first light. Being raised in the southeast of England where snow is quite rare, my experience with and on it is limited. But life hands out many lessons and I thought ‘proceed with caution’ and with a trusty four-wheel drive, full petrol tank and cooler full of food, we headed north. Highway 180 - a good wide highway with no traffic – winds through the San Francisco Mountains with their pine forests. Snowing heavily, it rather ominously reminded me of the movies ‘The Shining’ or ‘Fargo’. I had – and have not since – driven through such intense snow. In an unforested area, there stood a lone tree, bracing itself through winter, and I had to stop. No need to pull over – just stop. I pre-set the camera with lens and exposure and – dressed for the elements – climbed down from the vehicle. Five frames later, I was back in the warm cocoon. The early-light visit to the Grand Canyon became the late-light visit. It had taken us three hours rather than the normal one to get there. It was a very memorable day.